The SERDI 4.0 Power is the most versatile machine with pneumatic and hydraulic clamping of the workhead for the best rigidity during machining. Because of its triple air-floatation self-centering system, it makes the centering easier than any other machines in the market with an unmatched accuracy. Compared to the automatic machines, these manual operated SERDI machines are user-friendly for any operators and do not require demanding and expensive preventive maintenance. 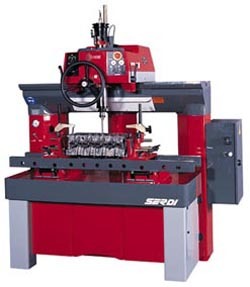 The SERDI 4.0 Power the industry standard for all types of cylinder heads: from Micro-engine to big stationary engines because of its heavy duty frame.